Hercules in combat with the centaur Nessus is shown as a freestanding ivory group on the lid. Round the ivory drum of the tankard are carved mythological scenes: Venus and Cupid, Minerva, Ceres, the drunken Silenus supported by bacchantes, Triton, and Neptune and Amphitrite riding on a chariot. A moustachioed man in contemporary dress is also depicted, seemingly gesturing towards a statuette of Hercules in a niche; this may well be a self-portrait of the artist. He is next to Minerva, goddess of the arts, who protectively holds out her hand. Behind the figures is a rusticated stone archway. The metal mounts show auricular masks and foliate forms. The tankard is signed on Neptune's chariot: 'Bernard Straus goldschmid fec.' and signed again and dated on the underside of the silver gilt lid: 'ANNO 1651. Bernard Straus. Goldschmidgesel, Von Marckdorf am Bodensee, Fecit, A. Vinde''. 'A. Vinde' is the abbreviation for 'Augusta Vindelicorum, the Latin name for Augsburg. 'Goldschmidgesel' should be translated as 'goldsmith's apprentice', and may imply that Strauss was learning to be a goldsmith at this point, and that possibly the lid pre-dates the tankard proper, given the slightly different form of signature on the ivory drum. The Hercules and Centaur group on the lid seems to be an adaptation of Giambologna's monumental marble group, Hercules slaying a Centaur of c.1595-1600 in the Loggia dei Lanzi in Florence. Strauss probably knew this in a reduced bronze version, of which there were examples in German courts. The figures around the drum are ultimately inspired by Peter Paul Rubens (1577-1640). This remarkable work is one of the great examples of baroque ivory carving in the collection, and a harmonious combination of sculpture and goldsmith’s work. The silver marks are those of Andreas I Wickert of Augsburg (1600-1661). Other ivory tankards with mounts by him are in the Badisches Landesmuseum, Karlsruhe, the Kunsthistorischesmuseum Vienna, the Staatliche Museen Kassel, the Kunstgewerbemuseum, Berlin, the Schlossmuseum in Gotha, and the Hermitage in St Petersburg; a silver and silver gilt tankard by him is in the Bayerisches Nationalmuseum in Munich. The present tankard was also reproduced in an electrotype version by Franchi and Son in Clerkenwell, London in 1859. Hercules in combat with the centaur Nessus is shown as a freestanding ivory group on the lid (Hall 1980, pp. 152-3). 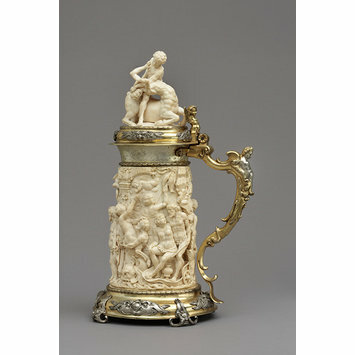 Round the ivory drum of the tankard are carved mythological scenes: Venus and Cupid, Minerva, Ceres, the drunken Silenus supported by bacchantes, Triton, and Neptune and Amphitrite riding on a chariot. A moustachioed man in contemporary dress is also depicted, seemingly gesturing towards a statuette of Hercules in a niche; this may well be a self-portrait of the artist. He is next to Minerva, goddess of the arts, who protectively holds out her hand. Behind the figures is a rusticated stone archway. The metal mounts show auricular masks and foliate forms. A gilt winged putto is seen on the lid, and a bare-breasted female herm on the silver gilt handle. The tankard is signed on Neptune's chariot: 'Bernard Straus goldschmid fec.' and on the underside of the silver gilt lid: 'ANNO 1651. Bernard Straus. Goldschmidgesel, Von Marckdorf am Bodensee, Fecit, A. Vinde''. 'A. Vinde' is the abbreviation for 'Augusta Vindelicorum, the Latin name for Augsburg. 'Goldschmidgesel' should be translated as 'goldsmith's apprentice', and may imply that Strauss was learning to be a goldsmith at this point, and that possibly the lid pre-dates the tankard proper, given the slightly different form of signature on the ivory drum. The lid inscription is now hidden beneath the metal mount. 'Bernard Straus goldschmid fec.' [and] 'ANNO 1651. Bernard Straus. Goldschmidgesel, Von Marckdorf am Bodensee, Fecit, A. Vinde'. 'A. Vinde' - is the abbreviation for 'Augusta Vindelicorum, the Latin name for Augsburg. The Hercules and Nessus group seems to be an adaptation of Giambologna's monumental marble group, Hercules slaying a Centaur of about 1595-1600 in the Loggia dei Lanzi in Florence. Strauss probably knew this in a reduced bronze version, of which there were examples in German courts; the bronze and silver versions in Italian collections actually pre-dated the marble group (cf. Avery 1987, pp. 114-9). The figures around the drum are ultimately inspired by Peter Paul Rubens (1577-1640); similar figures of the drunken Silenus, derived from Rubens, are seen on ivory vessels by Georg Petel (1601/2-1634) in the Städtische Kunstsalmmlungen Augsburg and the Kunsthistorischesmuseum Vienna respectively (Seelig 2001, figs. 12 and 13). The silver marks are those of Andreas I Wickert of Augsburg. Other ivory tankards with mounts by him are in the Badisches Landesmuseum, Karlsruhe, the Kunsthistorischesmuseum Vienna, the Staatliche Museen Kassel, the Kunstgewerbemuseum, Berlin, the Schlossmuseum in Gotha, and the Hermitage in St Petersburg; a silver and silver gilt tankard by him is in the Bayerisches Nationalmuseum in Munich (Seelig 2001, loc. cit.). This is one of the most magnificent examples of a characteristically German Baroque type of artefact. It is one of very few works signed by Strauss and the inscriptions provide much of the information known about him. The group on the lid showing Hercules slaying a Centaur is derived from Giambologna's celebrated marble sculpture (now in the Loggia dei Lanzi, Florence), which Strauss knew probably from a small bronze reduction, of which there were many at the German courts. The subjects round the sides include Venus and Cupid, Minerva (with helmet and spear), a man wearing contemporary costume and gesturing towards a statuette in a niche (possibly a self portrait by Strauss), the drunken Silenus supported by Bacchantes, Triton and Neptune and Amphitrite in a sea-chariot. Bought for 200 in 1858 (vendor unrecorded). Formerly sold for 157 10s. at the Lord Kinnaird Sale (Charles, Baron Kinnaird (1780-1826), auction at Mr H. Phillips, 53 Lower Grosvenor Street, London, 4 and 5 March 1813, lot 28; subsequently in the collection of Philip Howard Esq., Corby Castle, Cumbria. 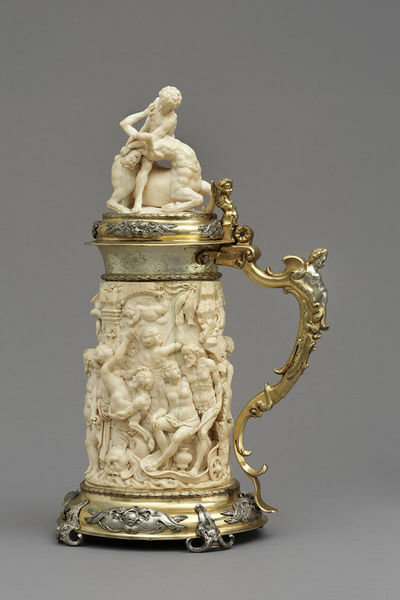 Ivory tankards were made in considerable numbers both in Flanders and in Germany during the 17th and 18th centuries.